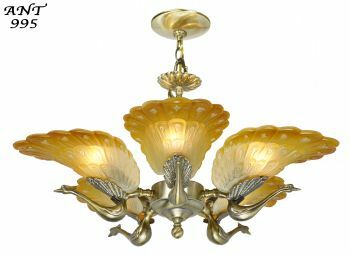 Art Deco style “not too old”....say 30 to 40 years..antiqued brass finished chandelier. Judging by the sockets, that were replaced, the origin was European and probably French. Now they are re-wired for American current and bulbs. The shades are most definitely in the style of Art Deco in their design. The metal is antique brass finished with a finish that has very minor blemishes commensurate with age. But it’s pretty darn good. 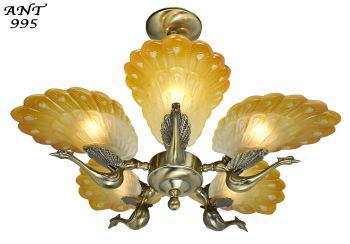 These chandeliers have been completely re-wired in our UL shop with new “old style” chandelier sockets. 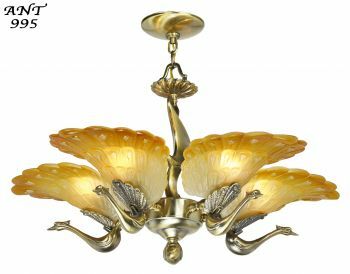 We will supply good bulbs along with this chandelier that we think gives the chandelier the correct ambiance...but of course...you can change them to anything you like. Measurements: The Overall chandelier height is 19”. The maximum width is 26”. 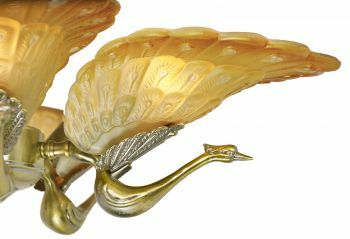 We have a matching pair of sconces, but their finish is in an satin nickel with the same shades. Price for the UL re-wired 5 arm chandelier: $ 1,850.00 plus careful packing and shipping. We originally had two identical fixtures, but as of today, only one is available. 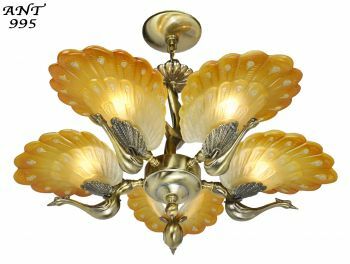 The sconces, ANT-875, if still available, are listed.